For many years, I wondered how agriculture could get its message out to the public about what exactly it is that we do. Why do we spray pesticides? Why do we grow GMOs? Why are farms so large, and what does that mean to food safety and rural communities? It seemed that there was no simple way to get these answers out to the consumer, and I pondered this as I went through university and after; until an idea came to me, a little more than a year ago. Why not just… tell them? And what better way is there to do that than to post it online? So, I started a blog, here on WordPress, to explain just what it is a farmer goes through in a year, and all the excitements, the frustrations, and the disappointments therein. Of course, this wasn’t the only reason I started this blog. I also wrote it as a form of therapy. Writing my frustrations down was a way of venting for me in an industry that can be very punishing. Mother Nature doesn’t care how hard you work, she doesn’t care how much you love what you do, and she certainly doesn’t care what kind of weather you want. Weather, and climate, just… is. It acts the way it does simply because it does. It’s a chaotic system so complicated that despite hundreds of years of study, nobody really has much luck trying to predict it. The realities of weather, combined with the difficulties in running equipment that can break down at any time, and working in an industry so heavily scrutinized by a critical public that sometimes seems to believe we should go back to farming like my grandparents did, can be exhausting, not to mention incredibly stressful. This blog has been a release for me to contend with the stress, and it has actually been quite effective. I guess those are the reasons I started this blog. And as I look back through the year that was, I realize that I accomplished that goal. Starting on April 18, 2013, I wrote my very first post about a winter that wouldn’t end and a spring that wouldn’t come. I poured out my frustrations and concerns about the dangers of weather like that preventing us from seeding, and what that would do to our farm. As the spring progressed, things began to improve (after the snow at the end of April, of course), and seeding actually went well until rains delayed us. It’s funny, looking through those blogs, how up and down last season was. I wrote a lot of posts in May, going from asking for wind and heat, to wanting for rain, to begging for the rain to stop! Fortunately, it did stop (just in time) and the crop went in. We dodged hail, plow winds, tornadoes and frost, finally getting the crop to harvest, when we learned it was the largest crop we had ever grown. The excitement over the massive crop was dampened by collapsing grain markets and plagued railway and elevator systems, causing what looked like a financial windfall to be reduced to a moderate profit. Then, thoughts turned to the 2014 growing season, and we purchased and booked fertilizer, seed and chemical for the new year. Finally, we have come to April once again, where once again we are delayed by a late spring! What is so interesting and exciting about farming is exemplified so perfectly in the 2013 growing season: weather that swings from one end of the pendulum to the other of wet to dry; the rush of trying to get the crop in and to harvest it; and the craziness of world financial markets that can cause you to swing from profit to loss in a matter of days. Farming is perhaps best described as a rollercoaster, with the ups and downs so extreme sometimes you wonder if you made the right decision getting on it in the first place! It is all one big adrenaline rush, with winter as the reprieve. Sometimes Mother Nature can knock you on your back, but you just have to get up and keep going. In my time writing this blog, I have learned a lot. I learned about other bloggers, some doing much like what I’m doing, writing about the day-to-day life of a farmer. Others focus more on advocating for agriculture, getting our positive message out there. For a long time, I wrote this blog quietly, keeping it mostly to myself and using it as a therapy session. In reading all the other blogs out there, I came to understand that writing a blog about a year in the life of a farmer should be more than just the basic day-to-day life, and that it doesn’t hurt to explain my own views and opinions on broader ag-related issues, such as GMOs and pesticides. Making this blog more public was a hard thing for me to do as well. I wrote a lot of personal stuff in it, talking about my own emotions and the hardships our farm has faced. I am not an open person when it comes to this, and I was afraid of the ramifications of doing this, and that it might diminish the ability of this blog to be a release for me. It was my wife that convinced me to try and get this blog out there, to get people to read it. How could I get my message out there without telling anyone about it? It was because of her that I made the effort to get my blog posted on AgMoreThanEver, an excellent website full of positivity for Canadian farming. From there, it amazed me how many people were- and are- interested in what farming is all about. I publicly posted all of my new articles after that, and was shocked at the positive reception. Having said all that, it has been difficult recently to figure out just where to go with this. I set out to write about a year in the life of a farmer, and I did that. I didn’t really have any long-term plans or goals with this blog, I was just writing because I truly love to write. Originally, I wrote for the stress release, which I don’t really seem to need anymore. I guess I found out that if we can get through everything that our farm has over the past 5 years, we can get through just about anything. For some time, I considered closing out this blog, with this as my final post. It has taken me awhile to figure out how to write this one, especially since I knew it may be my last. In fact, I was beginning to wonder if I really loved writing anymore, and that I may not need it anymore. Despite this, I think I need to keep writing about farming. I love what I do, and farming is a fascinating and vibrant business, and learning new things is a daily occurance. Furthermore, I love writing, and I love sharing my story about agriculture with anyone who will listen, even if its only a few people. To write something that touches someone’s life, or teaches them something new, is an experience that is hard to put into words, and this blog allows me to do that. As one of my close friends told me a few months ago, “just keep writing,” and that is what I intend to do. So, as we enter into yet another growing season, I will be talking about the joys, trials and tribulations of the life of a farmer, just as I have before. Paralleling that will be more thoughts on the broader world of agriculture, and why and how it affects us as farmers in our daily lives. Finally, I will keep explaining why we do the things we do, which sometimes may seem strange or questionable to those outside of agriculture. Agriculture is a fascinating industry, and farming is an incredible lifestyle. 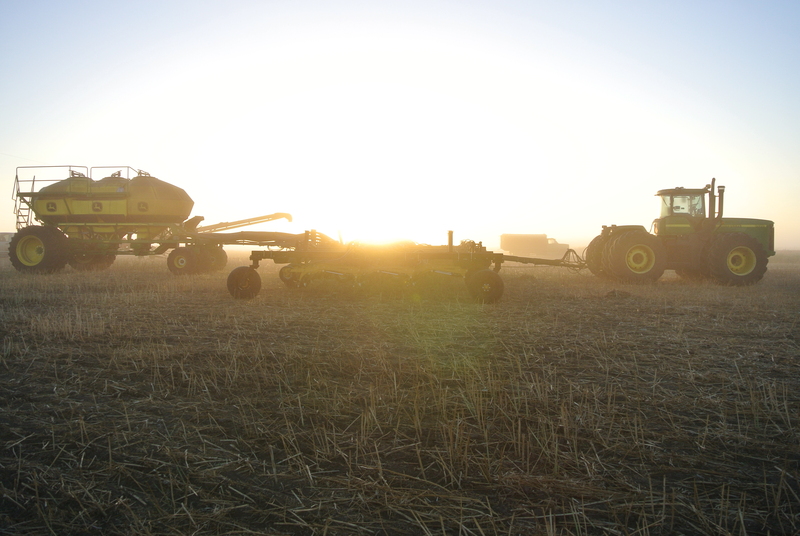 In this blog, you will find the daily thoughts, activities, and stresses of a farmer in Southeast Saskatchewan, Canada, from the little town of Fillmore. I hope you enjoy reading this blog as much as I enjoy writing it. Thanks for reading. P.S. : Listed below are links to some of my favorite ag-related blogs that helped me develop my own. Check them out! Previous Article Do We Really Need Chemicals to Control Weeds? Great to see more farmers talking about their experiences, I’ll be sure to see what your blog is all about! We need to be open and honest if we want the public to truly understand what it is we do for a living. Thanks for checking out my blog! Jake this is a great blog and thanks for including me on your list of influencers. It’s difficult sometimes to get into the routine of being more open and sharing our thoughts and activities but I thank you for the courage to do so. Keep on writing! I enjoy following along.